Laktionov is a Soviet artist, and the Letter from the Front is the most famous of his works, for which he received the Stalin Prize. It was conceived in 1944 after what happened to the artist’s history. In the Moscow region, where he and his family were evacuated, he met a wounded soldier, who, leaning on a crutch and clutching a bandaged arm to his chest, walked through the village. He stopped, asked how to find the right house – he was asked to send a letter – and Laktionov went with him to show. The scene of the delivery of the letter, which he found almost inadvertently, made a deep impression on him and became two years later the painting “Letter from the front”. His own children posed for him, a soldier became an old friend, also an artist, a girl with a bandage “Air Defense” – his young neighbor. The picture is a well-known storyline. A letter was delivered from the front and the whole family is glad that death is postponed again, that father and husband are healthy and alive. The soldier who brought the letter rests on the joint, smokes, looking at people around him with a smile – perhaps they remind him of his own family. The boy holds the letter in his hands, he looks enthusiastic and happy, the mother looks at the sheet from above, has an envelope in her hand, and has got a sheet. 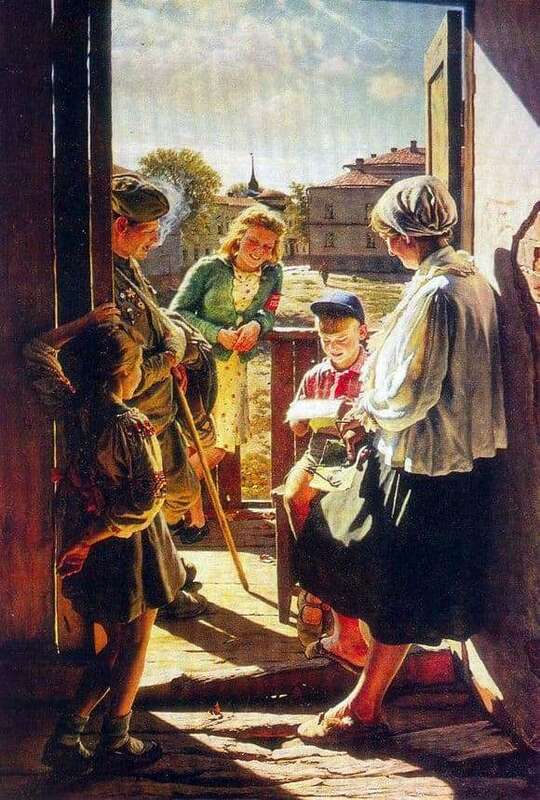 The girl stands with her back, you can see only the bright pigtails, and the girl with a bandage rests on the railing, and the whole scene, located in the doorway, is imbued with golden sunlight. He plays in his hair, illuminates human faces, and the joy playing on them, as if additionally highlighted. And the whole atmosphere of the picture is exactly that – sunny, happy, it seems to remind that no matter how bad the war, no matter how hard and scary, there are always moments in which there is a place for simple human feelings. For joy, for waiting, and every little thing turns into a miracle.